Troy and Sam were first introduced to the Rutland County Parent Child Center (RCPCC) in June 2016. Troy had been homeless for over a year and he and his fiancé, Samantha, had been staying in motels or on the street. They were ready for a change and in July of that year moved into Poise 1, the agency’s transitional living program, where they resided for a year before moving into a traditional 1-bedroom apartment rental also owned by RCPCC. 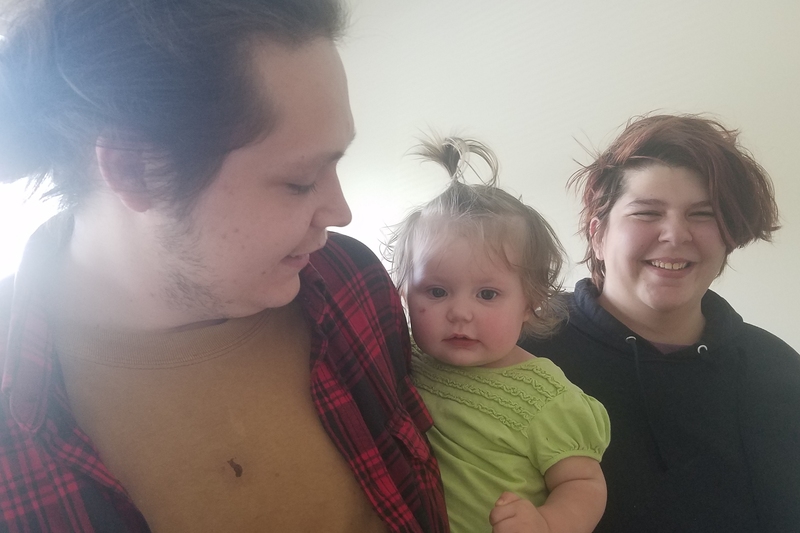 During their first year, they pursued their goals of Troy receiving his high school diploma, successful completion of the Poise 1 program, and learning as much as they could about how to be good parents to their new baby girl. They enrolled their daughter at RCPCC’s 5 star childcare center located on Chaplin Ave. and looked for permanent housing. Troy began to attend RCPCC’s Learning Together Program (LTP) as he was not comfortable in the local public school, but still had a strong desire to receive his high school diploma. He states that LTP has been a great experience for him, and he has felt supported and comfortable in this environment. In June of this year, he graduated while his family looked on. Troy and Sam are devoted to each other. They have experienced a lot of adversity in their lives and appear older because of their strong social skills, perseverance, and ability to overcome obstacles. In June of this year, they moved into a beautiful, new apartment complex in Rutland, complete with a community garden, playground, and early education site. They have chosen to keep their daughter at the Chaplin Ave. childcare center as this has been a good experience for her and she has strong attachments to her teachers. Currently, Troy is volunteering at the same place where his daughter attends her early education program. Sam donates her time to the front desk at RCPCC, learning office and reception skills. They are motivated and feel hopeful about the future. Lease signing with Vermont State Housing Authority! The Rutland County Parent-Child Center, one of 15 parent-child centers located throughout Vermont, is a community-based, private non-profit organization dedicated to supporting and meeting the needs of children, youth and families. 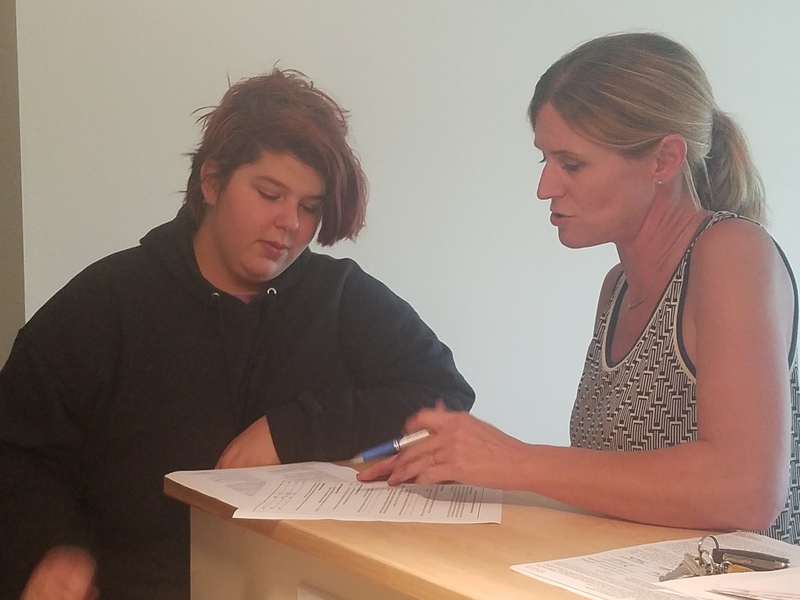 Learning Together is a program certified by the Vermont Agency of Education that focuses on pregnant and/or parenting youth who are working toward their high school diploma. It is a center based program that includes life skills, parenting, career readiness and emotional wellness along with the state required high school curriculum. RCPCC’s Early Childhood Programs are accredited through the STARS (Step Ahead Recognition System), a quality initiative of the Vermont Child Development Division, Department of Children and Families and the Department of Education. They use the Creative Curriculum and assess children using Teaching Strategies Gold on-line assessment system. RCPCC is certified as a specialized childcare facility. The Poise building consists of 5 apartments for parents transitioning to a more independent living environment. In this phase, parents live more independently but still have monthly case management and support available when needed, laying the foundation for independent living. This program focuses on empowering youth and developing the skills necessary for successful daily living.